In March 2009 corn ethanol producers asked for help from the federal government to expand their industry. Growth Energy, a consortium of ethanol producers, petitioned the Environmental Protection Agency (EPA) to allow 50% more ethanol in gasoline than is currently permitted, requesting approval for E15 fuel (a mixture of gasoline with 15% ethanol) (Growth Energy 2009). EWG's review of available scientific data finds that such an increase in fuel ethanol content may involve multiple human health and safety hazards and a risk of increased air pollution. EPA cannot legally grant the waiver because there are far too many unresolved scientific questions about the impacts of E15 on engines, emission systems and air quality. A higher ethanol blend may damage non-road engines and emission control systems. Emissions from higher ethanol fuels may worsen health risks from air pollution. Distribution of higher ethanol fuel blends may pose new safety risks and higher fuel costs. Higher-ethanol fuel blends may compromise lifetime performance of non-flex fuel vehicles. Also in question is whether ethanol fuels reduce greenhouse gas emissions when full life-cycle impacts of the fuel additive are considered (U.S. EPA 2009a). Numerous outstanding questions are the subject of several ongoing studies that have yet to generate a comprehensive dataset suitable for definitive scientific or regulatory assessment of blends above 10% ethanol (E10). A wide range of experts — including vehicle, engine, and equipment manufacturers; gasoline producers and refiners; EPA officials; public health experts and academics — advocate for adequate testing to answer important questions about E15's effects on engines, emission control systems and air quality (American Lung Association 2009; Bechtold 2007; Drevna 2009; National Marine Manufacturers Association (NMMA) 2009; Outdoor Power Equipment Institute (OPEI) 2009; U.S. EPA 2009a; U.S. EPA 2009b; Westerholm 2005). The limited data available clearly indicate that non-road engines and a sizeable number of older, still roadworthy vehicles could be damaged by increased levels of ethanol in fuel. Comprehensive scientific analysis and testing are needed before EPA will know the full extent to which E15 could damage the existing fleet of 247 million cars, trucks, and buses and 400 million non-vehicle gasoline engines (American Lung Association 2009; Drevna 2009; Outdoor Power Equipment Institute (OPEI) 2009; U.S. EPA 2009b). This document addresses the multiple concerns that have emerged regarding the use of intermediate ethanol blends like E15 by the current vehicle fleet and non-road engines. These concerns include potential adverse effects of ethanol on lifetime performance of vehicle emissions control systems; elevated emissions of toxic air pollutants associated with production and combustion of ethanol; decreased fuel economy; high cost and fire safety hazard of ethanol distribution; and the impact of ethanol fuel on non-road engines and outdoor equipment. These issues need to be addressed and resolved in a science- and data-driven, public process before a conclusion can be reached regarding the safety and advisability of widespread use of intermediate ethanol blends, including the current E10 blend. The analysis below reviews the currently available data for each of the health and safety concerns. The U.S. supplied 137.8 billion gallons of finished motor gasoline in 2008, according to the Energy Information Administration (EIA 2008). As the number of cars on the road continues to grow, government and industry efforts to maintain or improve air quality must include lowering vehicle emissions and minimizing the release of toxic air pollutants. Since the enactment of the Clean Air Act in 1970, Congress and the Environmental Protection Agency (EPA) have mandated a series of measures to bring less-polluting gasoline blends to the market, resulting in measurable improvements in air quality nationwide. In order to solve the energy and environmental challenges of the 21st century, we need to preserve and expand these air quality gains and protect public health by continuing to reduce motor vehicle-related air pollution. Ethanol was introduced into the U.S. fuel supply in 1978 through statutory default and without proper review by EPA. For most of the past three decades, formulators have mixed very low levels of ethanol with gasoline. Despite the industry claim that there is a successful history of "over thirty years' experience with use of ethanol-gasoline fuel blends” (Growth Energy 2009), only a small fraction of vehicles and equipment nationwide has been exposed to 10% ethanol (E10) fuel until very recently. 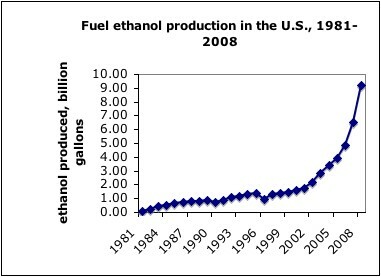 EIA estimates that 1.6 billion gallons of fuel ethanol were produced in 2000 (EIA 2008a). If the entire year’s ethanol production had been formulated into E10, the resulting gasoline-ethanol mix would have comprised just 12 percent of the 130 billion gallons gasoline sold in 2000. (EIA 2008b). Ethanol production and fuel blending accelerated after 2000, increasing nearly 6-fold over the course of 8 years and reaching 9.2 billion gallons in 2008 (EIA 2008a). Panel A: Fuel ethanol production in the U.S since 1981. Source: Energy Information Administration statistics, available at http://tonto.eia.doe.gov/dnav/pet/hist/m_epooxe_yop_nus_1A.htm. According to Energy Information Administration and U.S. Department of Agriculture (USDA) statistics, 95% of fuel ethanol is produced from corn (EIA 2008a; USDA 2006; Yacobucci 2008). Several factors have led to the expansion of corn ethanol production. First, MTBE, an oxygen-enhancing fuel additive (oxygenate), was banned by multiple states after it was found to contaminate groundwater. The industry substituted ethanol as an alternative source of oxygen for fuel blends. The expansion of the ethanol market was also driven by the Renewable Fuels Standard (RFS) under the Energy Policy Act of 2005 and RFS revisions under the Energy Independence and Security Act of 2007, both of which provided a major political and economic boost for corn ethanol producers. The corn ethanol industry also benefits from a 45 cent per gallon of ethanol tax credit — the Volumetric Ethanol Excise Tax Credit — that is provided for every gallon of ethanol blended with gasoline. A comprehensive review of the current state of the evidence regarding the potential impact of E15 on cars and non-road engines reveals that higher blends of ethanol can degrade emission control systems and increase emissions of acetaldehyde, PM2.5 particulate air pollution, ground-level ozone and other toxic air pollutants. Optimal vehicle performance, durability, and emissions require an effective match among engine design, vehicle emission controls and cleaner-burning fuels. Technological breakthroughs achieved in the last decade brought to the market a new generation of low-emission vehicles able to adapt to a wide range of fuels. But older, legacy vehicles constitute a significant portion of the current fleet. These legacy vehicles cannot adjust operating conditions to accommodate a wide range of fuels, which leaves their engines and emission systems at risk from ethanol fuel blends. Early catalyst burnout and materials damage from incompatibility with ethanol fuels would likely lead to increased vehicle and non-road engine emissions and worsening air quality (American Lung Association 2009; Australian Government 2004). In 2007 the DOE, the National Renewable Energy Laboratory (NREL) and the Oak Ridge National Laboratory initiated a test program to evaluate the impact of E15 and E20 ethanol blends on legacy vehicles and small non-road engines (Bechtold 2007; DOE 2009). The DOE data, together with the findings of an E20 study commissioned by the Australian government and published in 2004, concurred in reporting increased exhaust and catalyst temperatures associated with ethanol fuels blends, especially for older vehicles (Australian Government 2004; DOE 2009). Modern vehicles equipped with oxygen sensor-based, closed-loop control systems are calibrated during manufacturing to appropriately compensate for higher levels of oxygen in ethanol blends. Under open-loop conditions such as wide-open throttle, increased fuel ethanol content generally leads to leaner (less fuel-rich) operation. Many newer vehicles can adjust to ethanol-blend fuels in open-loop conditions by applying a procedure called long-term fuel trim (LFT). Modern engines are calibrated to apply the same type of fuel trim in open-loop as in closed-loop conditions and thus can maintain a stable fuel/oxygen ratio. In contrast, older vehicles and even some recent models cannot perform such adjustments for higher ethanol oxygen content in fuel under open-loop conditions, resulting in hotter exhaust. Panel B: Increase in catalyst temperature for E10, E15, and E20 fuels compared to E0 for vehicles operated at wide-open throttle (WOT) open-loop conditions. 43% of tested vehicles (red bars) experienced higher catalyst temperatures; the rest of the tested vehicles (blue bars) were able to maintain stable catalyst temperatures. Source: Figure 3.5 in the DOE (2009) report. 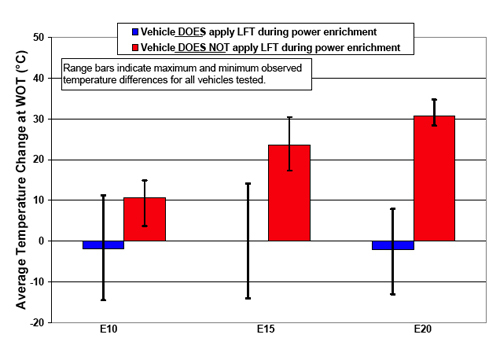 In the DOE study, 7 out of 16 vehicles tested (43%), including two 2007 model-year vehicles, ran significantly leaner during wide-open throttle as ethanol content in the fuel increased (DOE 2009). Vehicles that ran leaner during wide-open throttle compared to E0 baseline also experienced higher catalyst temperatures. Compared to E0, catalyst temperature was higher by ~10oC for E10, over 20oC higher for E15, and up to 35oC higher for E20. Increased catalyst temperatures due to ethanol blends would lead to accelerated long-term catalyst degradation, potentially causing significantly higher emissions of toxic air pollutants; the need for expensive, unplanned replacements that may fall outside of the original manufacturer's warranty; and a shorter useful life of a vehicle. Information on the expected rate of catalyst degradation is not yet available. However, if the DOE findings are representative of the overall state of the vehicle fleet, a sizable fraction of the vehicles on the road would fail to maintain stable exhaust and catalyst temperatures when operated on fuels with higher ethanol content. The risk of catalyst burnout may be indicative of a potentially wide spectrum of materials incompatibility problems for ethanol fuels (Bechtold 2007; Drevna 2009). As summarized in the 2007 DOE review, Technical Issues Associated with the Use of Intermediate Ethanol Blends, multiple studies found materials compatibility issues with E20, evidence of fuel filter obstruction even with E10, and likely impacts on driveability (Bechtold 2007). The Australian study reported that "greater levels of wear were observed for engines run with E20 than for those run with gasoline... [which] can result in compromise of the combustion system and lead to poor engine operation with resultant higher pre-catalyst emissions and increased fuel consumption" (Australian Government 2004). Widespread use of fuel with ethanol exceeding 10% could impact many 10's of millions of vehicles currently on the road that may be vulnerable to higher catalyst temperatures in wide-open throttle mode (American Lung Association 2009). The DOE research has not yet addressed the lifetime effect of ethanol fuels on vehicle performance and emissions, leaving a data gap that must be addressed to know the extent to which ethanol blends are incompatible with the current vehicle fleet. Moreover, there has been no testing of the impact of ethanol on vehicle engines and emissions systems for vehicles that have run more than their estimated full life (120 thousand miles) (American Lung Association 2009). To assess the impact of intermediate ethanol blends on the full useful life of catalyst systems, DOE is now planning an 80-vehicle study of catalyst temperature, performance, and durability (DOE 2009). As EPA stated in congressional testimony recently, it will take at least a year for the completion of these lifetime vehicle performance studies, and it seems very rational to wait for these data before considering approval for higher ethanol fuel blends (U.S. EPA 2009b). Other experts estimate that research to collect all the necessary data will require up to two years (Drevna 2009). Ethanol at concentrations up to 10% has served a valuable role as a fuel oxygenate, promoting more complete combustion of gasoline and reducing carbon monoxide (CO) emissions. The DOE study demonstrated a 15% reduction of CO emissions for E10 compared to E0. Importantly, no further CO reduction was observed with E15 and E20; in fact, vehicles operated on E20 produced slightly higher CO emissions than those on E10 (DOE 2009). E10 has been also reported to reduce emissions of inhalation carcinogens benzene and 1,3-butadiene (Whitney 2007). However, EPA-mandated reformulation of gasoline and introduction of better-performing engines and vehicle emissions control systems resulted in reduced CO and benzene emissions for conventional, unoxygenated fuels as well (U.S. EPA 2009c). Extensive research and testing carried out by the California Environmental Protection Agency Air Resources Board confirms that there might be better alternatives than ethanol or oxygenate additives in general for reducing vehicle emissions, including CO emissions (CARB 2008). These alternatives need to be thoroughly considered so that EPA and industry can implement the most economically and environmentally sound option for reducing CO and other air pollutants. While oxygenated fuels have been promoted for their ability to decrease certain air toxics, multiple studies have reported higher emissions of the hazardous air pollutants acetaldehyde and formaldehyde linked to increased ethanol content in fuels (Ban-Weiss 2008; Black 1998; DOE 2009; Grosjean 2002; Whitney 2007; Winebrake 2001). Both acetaldehyde and formaldehyde are considered by EPA to be probable human carcinogens (U.S. EPA 2007a). Formaldehyde is associated with respiratory tract irritation, chronic bronchitis, and airway inflammation (U.S. EPA 2007a). Acetaldehyde is a strong respiratory irritant and toxicant especially dangerous for children and adults with asthma. As demonstrated by a recent study, acetaldehyde air pollution is already presents greater than a one-in-one-million cancer risk at most sites nationally (McCarthy 2009). Further increases in acetaldehyde could lead to increased cancer incidence and wider prevalence of respiratory problems. The table below summarizes available information on the air pollution profile of ethanol fuel blends. These data indicate that instead of providing better air quality, ethanol fuel could well result in no measurable improvement, substituting one set of air pollutants for another, and possibly worsening air pollution overall (American Lung Association 2009). Ethanol (precursor to acetaldehyde) Released during both ethanol production and ethanol fuel combustion (Brady 2007; DOE 2009) Health effects due to acetaldehyde formation in the air (U.S. EPA 2009a). Volatile organic chemicals (VOCs) Emitted by ethanol production facilities (Brady 2007) Respiratory toxicants, contribute to ground-level ozone formation (U.S. EPA 2007a). A decision to adopt a particular fuel mix should take into consideration the full spectrum of air quality effects, including the potential air pollution from all stages of production, transportation, and combustion for the fuel. Without such a complete analysis and deliberation, it would be premature to make a determination to approve increased amounts of ethanol in fuel on the basis of partial and subjectively selected data points. As clearly demonstrated by the air quality studies above, introduction of corn ethanol could well fail to produce significant improvement in air quality and instead simply substitute one set of air pollutants for a different one, at a significant cost to society. In addition to potentially increased vehicle emissions, ethanol blending in fuel is also associated with several hidden costs that are passed directly to consumers. Compared to gasoline, ethanol is a lower energy fuel. As a result, ethanol fuel blends are associated with significant decreases in fuel economy, which has been observed by car owners nationwide (Learn 2009). According to DOE research, E10 has a 3.6% fuel economy loss compared to E0, E15 has a 5% loss, and E20 has a 7.7% loss (DOE 2009). Without constructing new pipelines, fuel ethanol can be transported only by rail or truck (EIA 2002). Currently, the majority of ethanol fuel distribution terminals are not connected to rail. Other areas are outside economic trucking distances from production plants. A recent study from Carnegie Mellon University calculated the average delivered ethanol costs, in 2005 dollars, to be in the range of $1.30−2.80 per gallon, depending on transportation distance and mode (Wakeley 2009). The study also noted that ethanol transportation would produce significant CO2 emissions and thus lead to larger total life cycle effects. Researchers concluded that long-distance transport of ethanol, whatever the means of delivery from production sites to distribution locations, would likely negate any potential economic and environmental benefits of ethanol relative to gasoline (Wakeley 2009). In addition to infrastructure gaps, fire safety concerns are also an issue with ethanol, since transporting and blending ethanol fuels could pose a significant fire hazard (DOT 2008; Niles 2007). Due to ethanol's high solubility in water, the use of water spray may be inefficient when fighting fire involving ethanol-gasoline blends mix (Missouri Department of Natural Resources 2008). Ethanol blend fuel fires cannot be readily smothered with standard fire fighting foam (Associated Press 2008; Missouri Department of Natural Resources 2008). As a result, distribution and dispensation of ethanol fuels above E10 could pose a significant fire hazard that requires specialized training and custom-made fire-fighting foams (DOT 2008; TRANSCAER 2009). Furthermore, current gasoline pumps have been developed to handle only up to 10% ethanol and are not certified by Underwriters Laboratories as safe for use with E15 (Lane 2009). While it may be possible for these pumps to handle ethanol levels up to E15, Underwriters Laboratories does not guarantee them for even 1 percent more (for 16% ethanol concentration), a situation that can readily occur during splash-blending of ethanol-gasoline fuels (Jensen 2009; Piller 2009; Underwriters Laboratories 2009). Approval of E15 could pose multiple risks from potential leaks, fire hazard, involuntary accidents and other mishaps that would severely affect gas station owners and their customers (Jensen 2009). Hundreds of millions of non-road engines are used across the country, including leaf blowers, line trimmers, chainsaws, lawn mowers, motor boats, generator sets, and small tractors. For many small engines, ethanol fuels could also be associated with increased emissions of hazardous air pollutants and ozone precursors such as hydrocarbons and nitrogen oxides (American Lung Association 2009; Sahu 2009). The DOE study (DOE 2009) reported that NOx emissions increased by 50-75% for small engines operated on E10 and E15 ethanol blends compared to E0, as demonstrated by data in Panel C. Air pollution with nitrogen oxides leads to aggravation of respiratory disease and increased susceptibility to respiratory infections. NOx also contributes to formation of ozone and particulate pollution with their associated adverse respiratory effects (U.S. EPA 2008). Panel C: Nitrogen oxide (NOx) emissions for small non-road engines versus fuel ethanol content. Source: Figure 3.12 in the DOE (2009) report. A growing body of data indicates operation of these engines on ethanol fuel blends would likely lead to both performance and safety problems. Unlike modern cars, small engines lack an oxygen sensor feedback control and are unable to compensate for higher oxygen content in ethanol-containing fuels. As a result, engines operate under "lean" or oxygen-rich conditions, which leads to engine overheating. Higher temperatures were detected for non-road engines operated on every level of ethanol in fuel (E10, E15 and E20) in the DOE study. Using an inappropriate fuel mix would impact the longevity of the engine and pose a hazard to the person operating it (Drevna 2009; Holshouser 2009; Johnson 2008; Oregon State Marine Board 2009; Outdoor Power Equipment Institute (OPEI) 2009; Williams 2008; U.S. EPA 1995). With its initial testing of a small sample of currently sold non-road engines, the DOE study already identified serious risks to the engine user (DOE 2009). In the study, three handheld trimmers demonstrated higher idle speed and experienced unintentional clutch engagement when operated on fuels with greater ethanol content. This means that small equipment could turn on spontaneously when fueled with higher ethanol blends, posing particular risks for equipment with exposed moving parts and blades like lawn mowers and chainsaws. "Small engines such as those in lawn mowers and lawn tractors, generators, line trimmers, chainsaws, and other similar equipment are open-loop engines, in that exhaust-sensing feedback is not used to control the fueling rate. Open-loop engines are commonly air-cooled and customarily operate in the fuel-rich regime to achieve cooler combustion temperatures. With a fixed fueling calibration, [increased ethanol content leads] to a higher combustion temperature and hence higher component temperatures" (DOE 2009). The DOE study detected higher exhaust temperatures for all non-road engines tested on every ethanol blend (Panel D). Relative to E0 baseline, exhaust temperatures rose by 16-42°C for E10, 19-47°C for E15 and 31-69°C for E20 (data from Table 3.13 in the DOE (2009) study). Panel D: Exhaust temperature increased for all non-road engines operated on ethanol blends. Left panel. Exhaust temperature increase for all small non-road engines tested in the new and full-useful-life (full-life) condition with ethanol blends, as compared to E0 baseline. Source: Figure 3.6 in the DOE (2009) report. Right panel. Exhaust port temperature for pilot study engines at hottest condition versus ethanol blend level. Source: Figure 3.15 in the DOE (2009) report. DOE detected adverse performance impacts that are consistent with multiple reports by small engine owners who observed a deleterious influence of ethanol fuels on their lawn mowers, trimmers, and motor boats (Holshouser 2009; Johnson 2008; Williams 2008). In addition to performance and safety concerns, ethanol compatibility with existing engine materials is a key issue for non-road engines (Outdoor Power Equipment Institute (OPEI) 2009). The risk is especially dire for marine engines (U.S. EPA 1995). When water gets into the fuel tank, as often happens for boats, the ethanol-gasoline mixture separates. This mixture sinks to the bottom of the tank, and when drawn into the engine for combustion will affect boat performance or even shut down the engine completely (Oregon State Marine Board 2009). In a recent statement to the Senate, the National Petrochemical & Refiners Association, National Marine Manufacturers Association and Outdoor Power Equipment Institute identified a wide range of safety concerns for ethanol blended fuel: higher exhaust gas temperatures; possible irreversible damage to engines; loss of durability due to incompatibility of materials; and disputes over warranty validity (Drevna 2009). Finally, most small engines are fueled from regular gas stations where the distinction between ethanol-containing and ethanol-free fuel may not be readily apparent (Fuel-Testers 2009). At the present moment, small engine owners face a nearly impossible challenge of ensuring safe operation of their machines, since they often lack access to information whether they are pumping an appropriate fuel into the tank. In summary, the broad range of risks that ethanol-containing fuels may pose to small non-road engines revealed in available studies does not support a decision to approve the use of intermediate ethanol blends. The data currently available on the effects of intermediate ethanol blends indicate a potential for significant effects on human and environmental health, and do not support a decision to approve the use of ethanol above E10 levels in the U.S. A comprehensive assessment of ethanol fuel impacts on air quality should consider fuel compatibility with the current vehicle fleet; effects on catalyst durability, materials compatibility and driveability; and air emissions from all stages of fuel ethanol production, transportation, and combustion. As summarized by a DOE report, "the U.S. legacy fleet is too diverse to predict E15/E20 impacts from the limited available data" (Bechtold 2007). Until these data are generated and assessed, consumer safety, public health, and environmental protection may be at risk from adoption of mid-level ethanol blends.